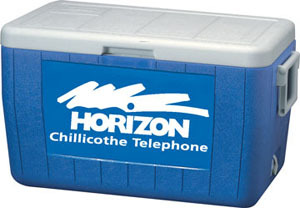 Coolers offer a great way to showcase your corporate image. Coleman's most popular chest size cooler. Holds 2-liter bottles upright, hinged lid with easy 2-way handles, rust proof and leak resistant drain and impact resistant storage tray. Durable, built Coleman strong to last for years.